The paper “Before and After the Cayo Coco Causeway: A Critical View from Space” by Cepero and Lawrence (in this volume) is a useful and important application of remote sensing to the study of the Cuban environment. In this application, the authors focused on the extent and health of the mangrove coverage in the Bahía de los Perros region on Cuba’s north coast before and after the construction of a causeway (pedraplen) joining the Cuban mainland with Cayo Coco. These comments are divided into three parts. The first part briefly describes remote sensing of the earth. The second part addresses the data and methods used by the authors, and makes some suggestions on how they might be able to improve the results of their application. The third part discusses more broadly the potential of remote sensing as a tool to study Cuba’s environment and proposes some areas for future research. Remote sensing is commonly defined as the measurement or acquisition of information of an object or phenomenon by a recording device that is not in physical or intimate contact with the object. There are many examples of remote sensing: measurements from satellites, space probes, ultrasound for medical diagnosis, medical imaging. In remote sensing of the earth from satellites, an image is collected by on-board sensors that receive waves of electro magnetic (EM) energy radiating from or reflecting off the earth’s surface, which is then converted to arrays of numbers, or pixel values. There is a large variety of sensors, differentiated primarily by the type of EM energy they capture. 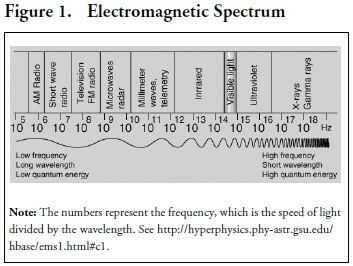 The spectrum of EM energy is characterized by the length of the waveform, from 20 meter radio waves to infinitesimally short X-rays (see Figure 1). In between are infrared waves with lengths ranging from 10-3 m to 7×10-7 m, and visible light with wavelengths ranging from 7×10-7 m (red) to 4×10-7 m (blue). Early sensors captured energy on film that was sensitive to the visible wavelengths; since these sensors did not distinguish among red, green, and blue light, they produced only black and white photos. Modern “multi-spectral” sensor systems capture energy from different portions, or bands, of the EM spectrum on different arrays of sensor components, producing a separate digital array for each band. For example, the Landsat imagery that Cepero and Lawrence use in their study, produced by NASA and the US Geological Survey (USGS), was collected by sensors that distinguish 7 different energy bands, yielding 7 separate image planes. Because different materials on the earth reflect or radiate different amounts of energy across the EM spectrum, this multi-spectral imagery provides earth scientists with a tremendous wealth of information about the composition of the imaged area. Two very sophisticated types of systems are available to analyze this information. • The first system is the human visual system (HVS)—our eyes and parts of our brain. The arrays of digital numbers can be displayed as colors, and since our eyes can distinguish the combination of three bands as colors, we can combine any three image planes of a multi-spectral collection to produce a single image, and make sense of the patterns in it. If the three bands happen to be the ones from red, green, and blue energy, the combined image will look like what we see looking out an airplane window. But to scientists familiar with energy reflected from specific vegetative land cover, other combinations of three bands may be more interesting. Viewing these false color, or pseudo-color, images can pinpoint specific issues of interest to researchers (e.g., the health of plants). • The second system for analyzing remotely sensed images of the earth comprises what are generally referred to as Geographic Information Systems (GIS), which complement the HVS with powerful mapping, measurement and analysis capabilities. Geographers and image scientists have developed an amazing variety of algorithms to automatically perform the measurements and analysis the HVS does, but in a more thorough and systematic way. GIS can detect effects too subtle for the HVS and can accurately measure regions of different pixel values or textures. Various image overlays of cultural features, such as bridges, roads, buildings, telecommunication lines, also add tremendous information processing capabilities. (Google Earth, http://earth.google. com/, is an accessible example of these capabilities.) GIS also enable comparing images from different time periods to analyze changes that have occurred. Currently there are several space programs, both government- and commercially-operated, that provide enormous quantities of earth imagery to the public. The Landsat project, in operation since 1972, is one of the principal satellite systems used in natural resources management. It currently employs two multi-spectral sensor systems, the Thematic Mapper (TM) and the Enhanced Thematic Mapper Plus (ETM+). Cepero and Lawrence use data from each of these Landsat systems in their application. In particular, they calculate two arrays of Normalized Difference of Vegetative Index (NDVI) values based on the near infrared and red image bands from1990 TM and 2000 ETM+ imagery of the Cayo Coco pedraplen (see Figure 2). The authors treat these NDVI arrays as images and, using visual inspection and a GIS, they compare the index values for the two years for the region. Their approach enables a clear understanding of the impact of the causeway on the health of mangrove growth there. In the process of their analysis, the authors encounter an artifact in the imagery, a striping effect in the 1990 image that was only apparent in the water region. To ameliorate the problem they first used a smoothing technique, dropping the high spatial frequencies of the Fourier-transformed image and then inverse transforming back to the image domain. This did smooth out the striping in the water region, but also caused undesirable smearing throughout the land regions. Hence, they rejected this smoothing approach and instead subtracted the water pixels from the images and then proceeded with their analysis. However, the striping was probably a global image artifact: the land mass pixels are more variable than the water pixels, and that variability likely hid the subtle striping there. Subtracting the water pixels would therefore not solve the problem, nor even affect their calculations, since the water pixels were masked out of the image before calculating the NDVI on the mangrove areas. To determine whether the striping artifact actually affected the NDVI analysis, the authors might produce the NDVI mangrove damage classes using a both a “de-striped” version of the 1990 image (even though smearing results from this smoothing operation), and an uncorrected image (essentially the approach that the authors report on here). It would be interesting to know a bit more about the NDVI. The authors state that the lower NDVI values indicate stressed or unhealthy vegetation. Do very low values indicate complete loss of vegetation? 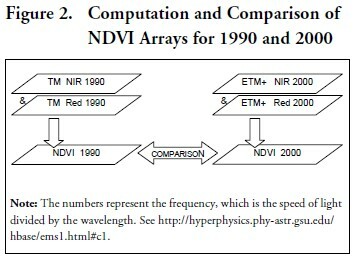 The “model calculating the difference between the 2000 and 1990 NDVI outputs” is not specified, yet the damage classes are derived from the model output. It would be especially interesting to know how the damage classes were determined. Are these standard ways of measuring land-cover damage? Are these classes specific to tropical and/or coastal vegetation? It is not clear in the paper how the exact region to be analyzed was selected. Was it determined by a certain distance along the coast from the causeway footings on either end of its span? Does the region extend inland a certain distance? Do the images used cover the entire region that might be damaged? From Figure 6 in their paper, it appears that terrain judged to be in Class 1, minor damage, extends to the edge of the image, suggesting there may be more damage beyond. The authors mention a mask that determines Cuban mangrove land cover, but do not give its source. Also from Figure 6, it appears that in some cases Class 1 damage occurs further inland from areas with no damage. Why would this be so? Finally, to further pursue this important research topic, the authors may want to explore whether declassified imagery from the early U.S. Government photo reconnaissance systems might provide baselines for their work.1 Satellite imagery from the CORONA program (http://www.nro.gov/corona/cor-ab .html) was collected between 1960 and 1972, while aerial imagery from the SR-71 Blackbird program was collected from 1962 to 1995. The imagery was pan-chromatic (black and white), rather than multispectral like the Thematic Mapper imagery used by Cepero and Lawrence, but had higher resolution (2 to 8 meters for CORONA). The imagery was declassified in the mid-1990’s and is available from the U.S. Geological Survey (http://edcsns17.cr.usgs. gov/ EarthExplorer/). Among the problems that scientists face in analyzing issues related to the Cuban environmental are barriers to gaining access to the Cuban territory to conduct field research, and restrictions that the Cuban government imposes on independent environmental organizations. Remote sensing obviates these problems and provides the opportunity for unbiased and scientific treatment of the very controversial and important topic of the current environmental situation of the island. v Validate alleged salinization in the provinces of Granma and Camagüey, and measure its prevalence over time, by examining changes in ground cover. • Pedraplenes : Extend the work by Cepero and Lawrence regarding the Cayo Coco pedraplen to other causeways and explore the possibility of extending the analysis to cover changes in water flows and effect of the pedraplenes on the marine environment. • Dique Sur : Examine areas in the southern region of La Habana province to assess the environmental impact of the Dique Sur,4 including waterlogging, reduction in the mangrove ecosystem, and coastline erosion. • Mining: Examine areas of Eastern Cuba where nickel strip mining operations have been conducted to determine the impact of such activities on forested land, on land erosion, and on the marine environment (including coral reefs). Compare current situation with the situation in 1990, prior to the push to enter into joint ventures with foreign investors to develop the nickel mining industry. • Industrial pollution: Examine areas affected by air pollution caused by industrial plants such as nickel processing plants, cement plants, sugar mills, etc. • Bays and estuaries: Examine pollution in bays and estuaries caused by discharges from industrial plants, sewage systems, runoff from agricultural lands, and so on. Remote sensing is a powerful approach to studying the environment and management of natural resources. In the case of Cuba, this approach is particularly relevant given the lack of access to the Cuban territory by independent scientists and researchers to conduct on-site studies. Cepero and Lawrence’s paper, which uses generally available imagery and remote sensing technology to analyze the Cuban environment, is a significant contribution to an effort that deserves institutional support. We hope it will encourage additional work by other researchers. 1. For general descriptions of U.S. military aerial imagery programs see Philip Taubman, Secret Empire (New York: Simon and Schuster, 2003) and William E. Burrows, Deep Black (New York: Berkley Books, 1988). 2. This list of environmental issues is drawn from Sergio Díaz-Briquets and Jorge Pérez-López, Conquering Nature: The Environmental Legacy of Socialism in Cuba (Pittsburgh: University of Pittsburgh Press, 2000). 3. Marabú (Dischrostachys nutants) is a leguminous plant, generally regarded as a pest but with the ability to regenerate exhausted agricultural soils by fixing nitrogen in its roots. Marabú is very thorny and difficult to eradicate. 4. The Dique Sur is an underground dike whose construction began in 1985 in the south of La Habana province. It is intended to arrest the inland infiltration of saltwater into aquifers and prevent freshwater losses to the sea. The Dique Sur is reportedly 100 kilometers in length, with a width of 7 meters and a depth of 2-4 meters; it runs from Majana in the West to Batabanó in the East. See Díaz-Briquets and Pérez-López, Conquering Nature (2000), p. 129.